The rest of the house is just waking as Scottie Sizemore plops down in a rocking chair on his front porch with a cup of coffee. It's midmorning, but the sun has yet to crest the ridge above, where mist clings like clouds that couldn't quite make it over. 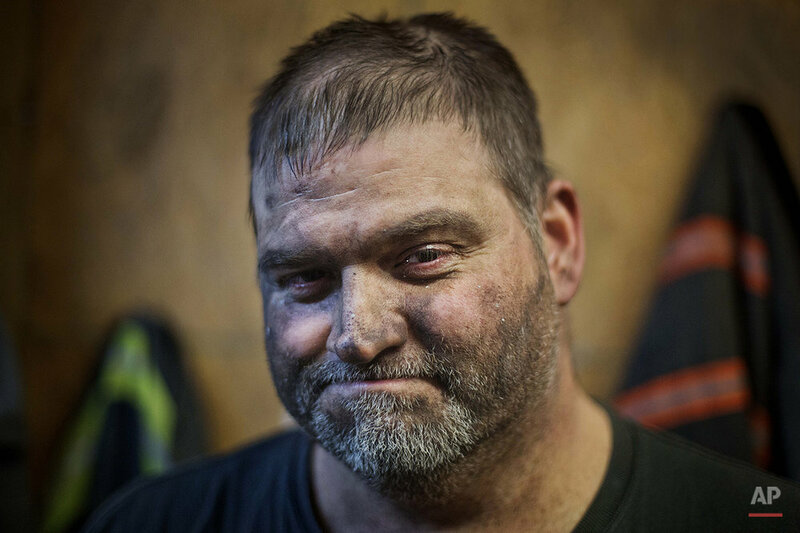 Sizemore is the fourth generation of his family to mine coal in the hills of Harlan County. He knows he'll probably be the last. There is a growing sense in these mountains that this downturn is different, deeper. That for a variety of reasons — economic, environmental, political — coal mining will not rebound this time. A thought on many people's minds is captured in a display in the windows of a vacant furniture store up the road in the once bustling town of Cumberland: "WHAT NEXT," it says. State and federal initiatives are exploring everything from ecotourism and small farmer loans to regional tax incentives for job creators. Others are still praying for a regulatory climate change that will breathe new life into the region's mines. For Scottie Sizemore and his wife, Madonna, the answer is simple, if painful. They're leaving. "I feel in my heart that there is no hope for Harlan. There's no hope for our children in the future here," Madonna Sizemore says, tears filling her eyes. 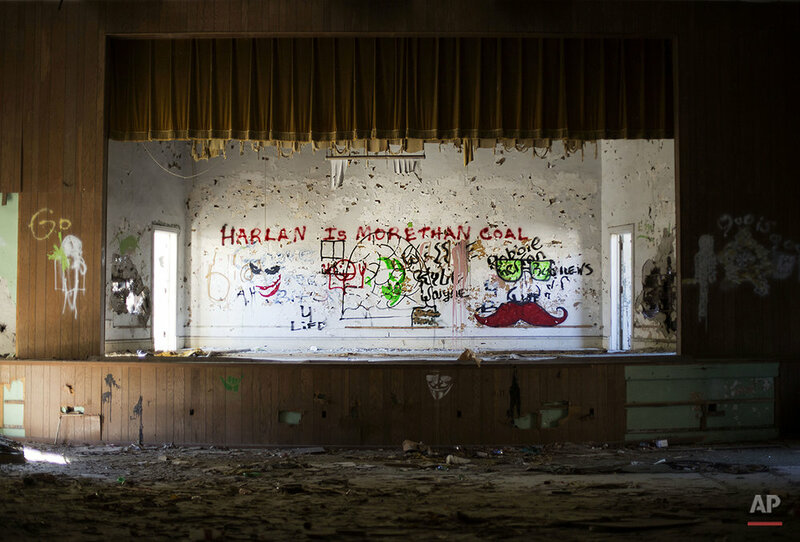 On the peeling white wall above the dilapidated Lynch High School auditorium stage, someone has scrawled a defiant message in bold, red letters 3 feet high: "HARLAN IS MORE THAN COAL." Morgan, Henry Ford and other barons of industry were attracted by the region's rich seams of metallurgical coal — the high-quality mineral used to make coke for steel production. Entire cities sprang up to service the mines, but not without serious growth pangs: In the 1930s, the hollows and bottoms around here echoed with gunfire as union organizers and company "thugs" warred over who had the right to mine coal. The county earned a nickname that sticks to this day: "Bloody Harlan." On a recent afternoon in the hills above the tiny coal camp of Verda, Steven "Fish" Fields crawled inside an abandoned mine he'd played in as a child. The 49-year-old laid-off miner pointed to a thick black line running along the wall and off into the darkness: Coal. 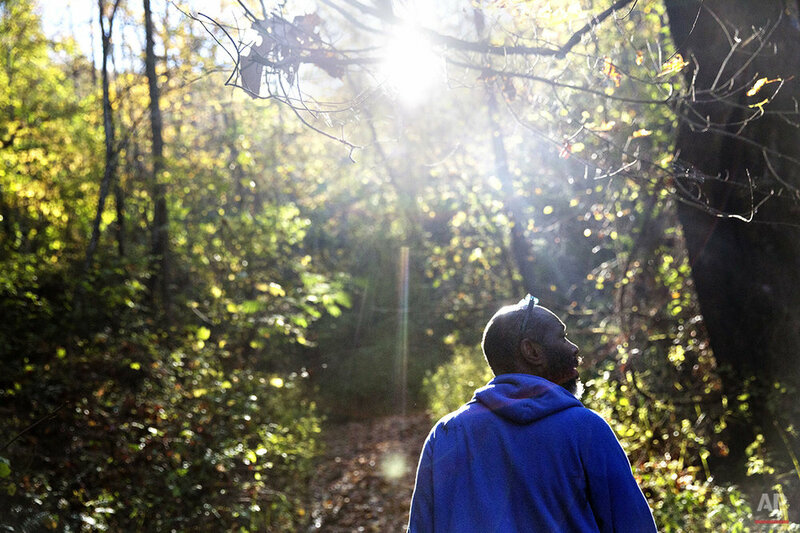 In this Oct. 19, 2014 photo, unemployed coal miner Steven Fields, 49, walks through an abandoned coal mine near where he grew up in Verda, Ky. His last job was with his family's T-shirt printing business, at $10 an hour. 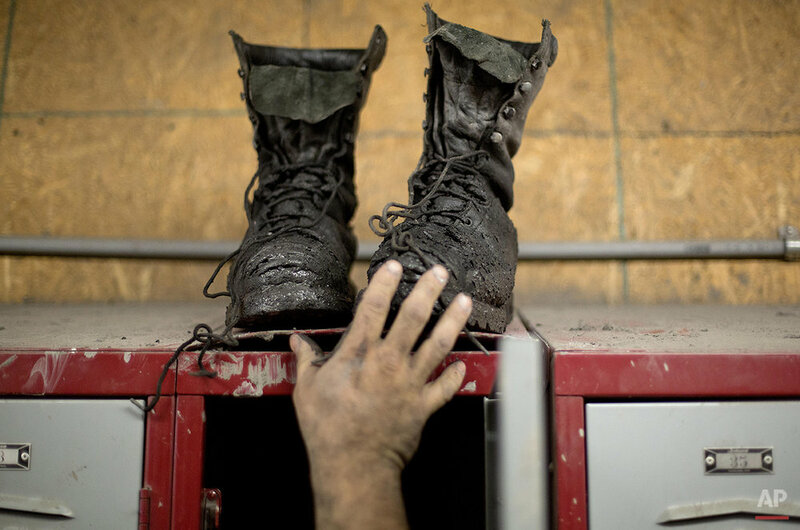 Despite lungs choked with coal dust, Fields said that he yearns to go back underground. (AP Photo/David Goldman). "It runs between 8 and 9 foot high on back in the back," he said. He and others here wonder why they can't mine the untapped riches beneath their feet. The Energy Information Administration estimates that there are about 30 billion minable tons of coal left in Kentucky — more than twice the amount pulled from the earth since settlement in the late 18th century. Nearly a third of those "recoverable reserves" are in the eastern coalfields. But mining it comes at great cost — both financial and environmental. In late November, the spot-market price for Central Appalachian coal was $56.10 per ton, according to the EIA. That's nearly $45 higher than coal from the Powder River Basin out West, where huge drag lines scoop the coal from the earth like so much ice cream from a carton. Most of Harlan County's "big coal" — seams thick enough for a worker to walk upright in — has long since been mined. According to the EIA, most of what's left — 9.1 billion tons — can only be realistically gotten by surface or "strip" mining. Around here, the most cost-effective method is "mountaintop removal," in which the hills are blasted apart to expose the coal beneath. But stricter interpretation of clean water and other regulations by the Environmental Protection Agency and the courts in recent years has all but ended the practice. It's part of what critics like C.V. Bennett III call President Obama's "war on coal." Bennett's family has been running mines in Harlan County for 102 years. But unless the government backs off considerably, he's not sure they'll last another five. "It's kind of like being a ship adrift in the middle of the ocean," says Bennett, 63, who's done about every job underground from rock-dusting to shoveling the belts. "But you just keep hoping you're going to hit land somewhere and somebody will see the plight of where this country's going." Click any image to launch full view with caption. 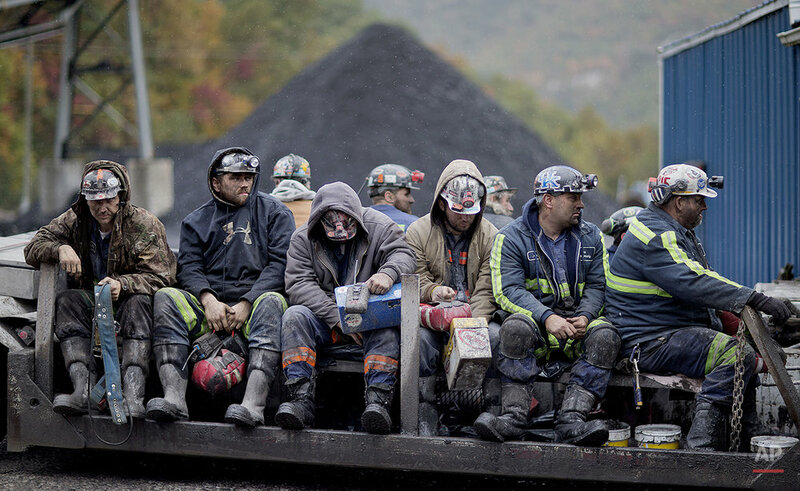 Since January 2012, the state has lost more than 7,000 direct mining jobs; fully half of the coal jobs in eastern Kentucky have vanished in the past five years. During the period, Bennett's workforce has dropped from more than 600 to fewer than 200. "That hurts me more than anything else, is seeing people I've known and grown up with," he says. "To have a future and then all of a sudden to have that future jerked out from underneath them — with no hope of it ever coming back." When Fields was laid off five years ago, he says he was making $25.50 an hour. His last job was with his family's T-shirt printing business — at $10 an hour. "It's a hard pill to swallow when you're laying at home and your wife's supporting you, instead of you supporting your wife," he says, huffing and coughing. "I've got to go," Scottie Sizemore says as he leans in to kiss 10-month-old Anastyn. "You all be careful." "YOU be careful," his wife says. "Come back," she says, as her father gently lowers her to the ground. 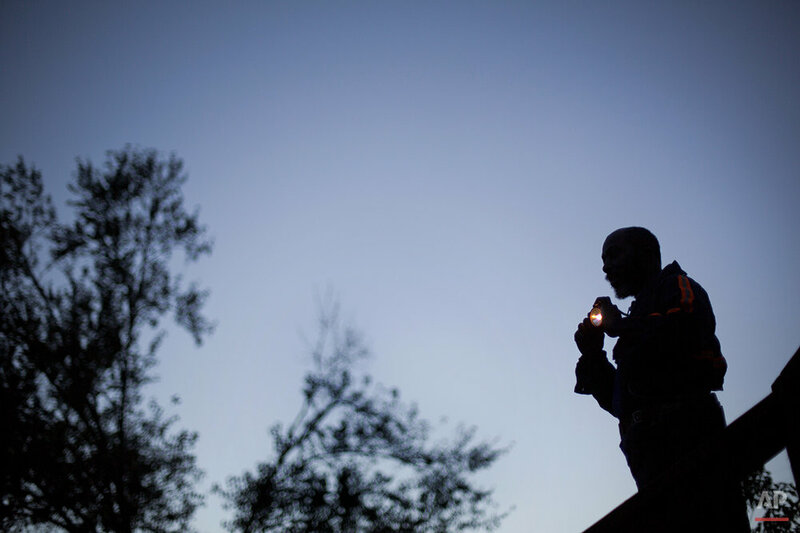 Madonna Sizemore watches as Scottie's truck rumbles over the railroad tracks and crosses the river, following the setting sun westward. 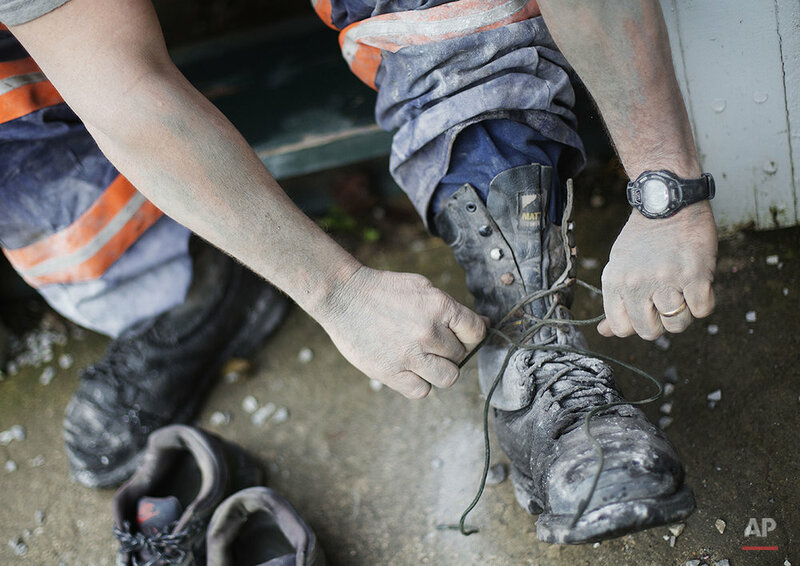 By morning, he'll be back at work underground — 340 miles and a world away. In October, Scottie took a job as safety specialist with Patriot Coal in the newly booming mines of western Kentucky. He's not alone. For more than a century, eastern Kentucky outproduced the state's western coalfields. But in the past year, the balance has shifted to the west, where seams are shallower and thicker, but higher in sulfur. Unlike so many others, Sizemore hadn't been laid off. But the company he was working for had cut salaries 7½ percent and was preparing to take another 7 percent. "You can sit here and take the cuts," he says. "Or you can choose to move and continue making the money you're used to making." Still, the change is hard. To Donnie Reeves, leaving Harlan County felt like "just giving up." When he was laid off last year, Reeves applied for federal study grants and entered an industrial maintenance course. The 41-year-old is now making good money in his new job maintaining heavy equipment at Aichi Forge — one of the many parts manufacturers that have sprung up around Toyota's sprawling auto plant in Georgetown. Reeves says life is pretty good in the Bluegrass region — famed for its rolling pastures, horse farms and tobacco fields. But he misses being able to step out his back door and hike up into the hills. He misses going "ginsenging" and riding his four-wheeler on the blacktop. "It makes you a little bit bitter," he says. "That you can't stay where you want to be." Between 1900 and the outbreak of World War II, Harlan County's population grew nearly eight-fold, to a peak of 75,275. Today, it's around 28,000 — the lowest since 1920. 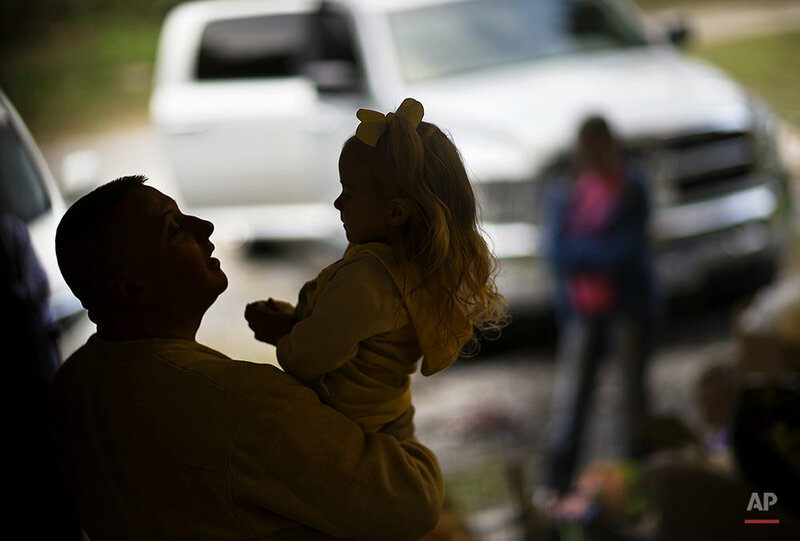 In the past two years, Keith Johnson was laid off from one coal company, then moved to another, only to have it close. 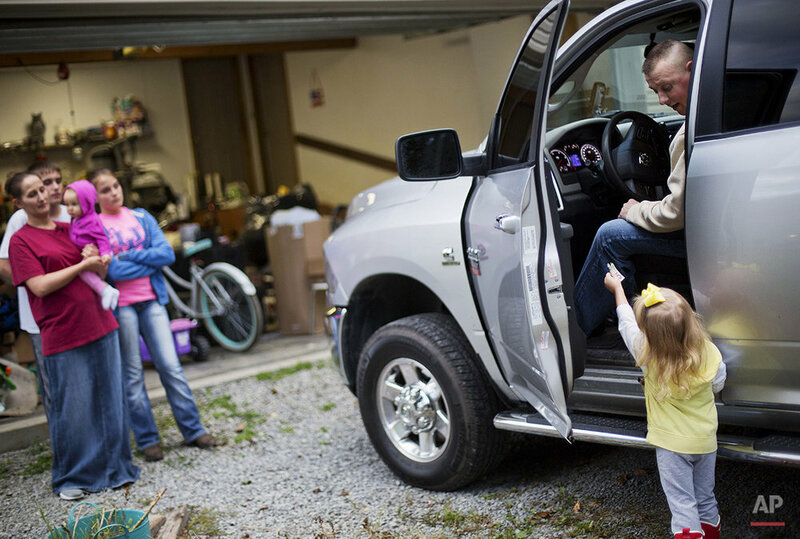 At 43, he's gone from being a foreman making about $100,000 a year to a common miner at $20 an hour. "I had four W-2's last year," he says with a laugh. Johnson, 43, is paying on a $20,000 hospital bill incurred while working at a company that offered no insurance. He's spent about $40,000 from his retirement fund to stay in Harlan, at least until his son graduates from high school this spring. Eddie Jones, 56, hunches in front of a flickering computer screen at the Kentucky Career Center in Harlan. Nearby hangs a poster with a photo of a man in a hard hat and the acronym "H.O.M.E." — Hiring Our Miners Everyday. Jones was laid off in May 2013. To stay near family, he's been making do with odd jobs — painting, digging ditches, mowing grass. He's angry that Congress failed to extend his unemployment beyond 26 weeks. He's aggravated with local politicians who couldn't get the roads and infrastructure that might have made Harlan County more attractive to businesses other than coal. "They've bailed out every entity in the country," he says. "The banking industry. The airline industry. The car industry. Everybody but the American worker." The director of the Kentucky Center for Economic Policy, Bailey says that for years, a major focus was to develop former mine sites into industrial parks. But many of those parks and spec buildings were soon abandoned — or never occupied at all. Government has found ways to help tobacco farmers and redwood loggers transition away from those industries, says Bailey. This region must be compensated for the cost it has borne "in providing the cheap power that built the modern American economy." "The region has paid it in spoiled water and degraded land and black lung disease, broken backs, torn-up roads, blasted mountains," he says, noting these issues make it harder to diversify. "I think there is a debt owed." Harlan County is included in one of President Obama's "Promise Zones," giving the region priority to access federal money to create jobs and improve educational opportunities. There is also the federal-state SOAR Initiative — Shaping our Appalachian Region. At a recent gathering in Natural Bridge State Resort Park, working groups presented a series of ideas, ranging from tax incentives to lure companies to the region, to small loans to help farmers connect with markets. Late last month, the group's executive board voted to support legislation to establish an economic development fund with revenue from taxes on income, sales or each ton of coal mined in the state. Many feel they can't afford to wait and see if these efforts bear fruit. Scottie Sizemore has been sharing an apartment with another transplanted Harlan Countian. But if all goes well, he hopes Madonna and the children will join him soon. "It's just like a piece of the Lord's hands is here," she says, her voice breaking. "And He keeps us protected." But she knows these hills can't shield the next generation from the harsh economic realities bearing down on Harlan County. Just six years ago, Harlan County High opened — a gleaming, multimillion-dollar facility taking in students from dying schools in other parts of the county. But enrollment is down by about 10 percent from a first-year high of 1,150. It is part of a troubling trend. "It's a whole generation that doesn't have anywhere to go exactly," says Robert Gipe, director of Appalachian studies at Southeast Community College & Technical College, up the road in Cumberland. No one is saying that mining will cease altogether here — at least not anytime soon. But when you've been so dependent for so long, there are bound to be withdrawal pains — and denial. On the third floor of HCHS, a large poster hangs on the wall down the hall from Tami Brock's classroom. It depicts the many benefits derived from the black mineral. "Coal is America's Future," it declares. But fewer and fewer of Brock's students believe that. "Probably 20 percent of my kids' parents are laid off," says Brock, who taught at Cumberland High before it was closed and merged with Harlan County. 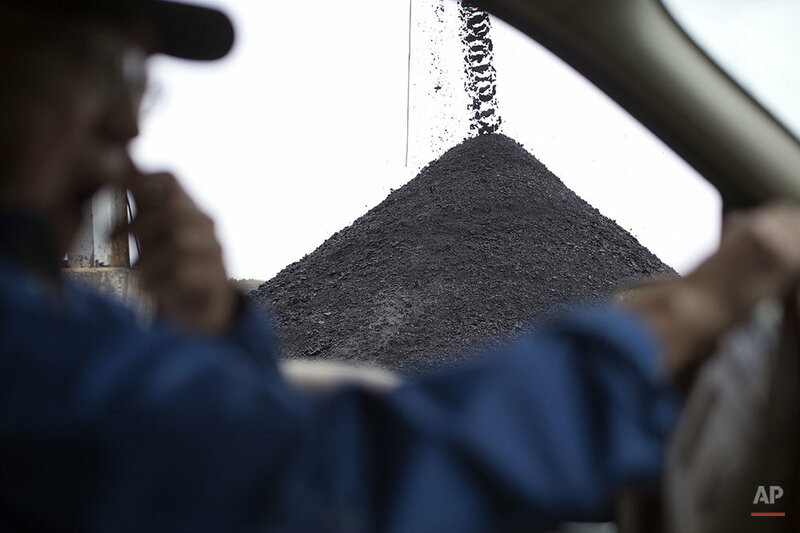 "The way the coal industry is, it kind of comes in waves. But there's never a big wave that stays. It just doesn't stay anymore." On a recent Friday, Brock assembled a group of eight students in her classroom. When asked how many have a close family member who's worked in the mines, every hand went up. Next fall, she hopes to go to Eastern Kentucky University. She doubts she'll come back to Harlan County. "There's just really nothing here for me to do," she says. "I don't think I could possibly make a living here." "Is there anything out there for me to do?" Jessica Stewart, 17, asks. But not everyone in this classroom has given up on coal — even if they've given up on Harlan County. After graduation, Travis Fields, 18, plans to get his miner's papers and relocate to western Kentucky. "It's going to be a ghost town," he says of Harlan. "There ain't going to be nobody left — only the people that draw checks." That night, as the Harlan County High Black Bears football team storms the field at Coal Miners' Memorial Stadium, a cannon booms and a loudspeaker blasts the chorus of Darrell Scott's ballad, "You'll Never Leave Harlan Alive!" "Ladies and gentlemen, you know why these lights are on tonight? It's because of coal! 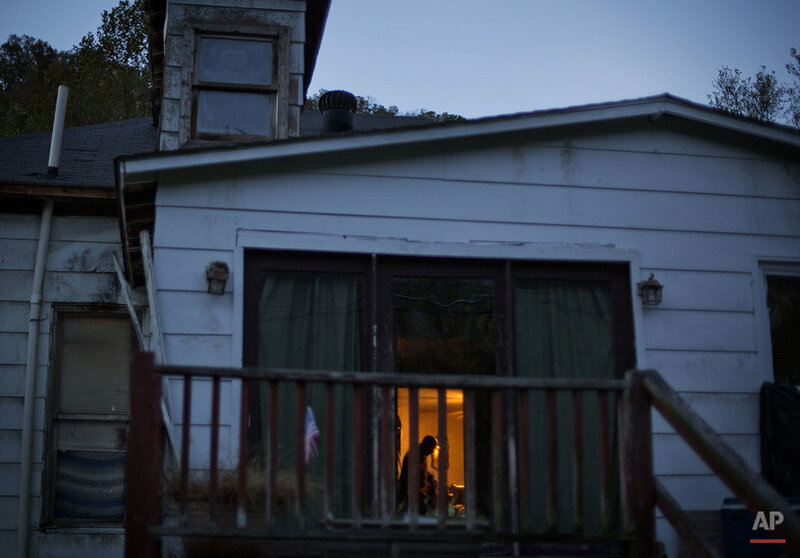 This is coal country," he shouts. "Would all the coal miners in this stadium stand up?"